The Millenium Promenade begins on The Hard, close to the Dockyard Gates and finishes on Southsea seafront. The plaque is set into the pavement by the capstan. 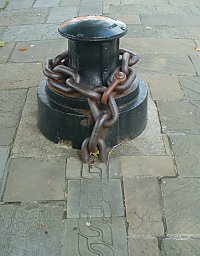 The Promenade can be traced by following the links in the chain set into the pavement. It follows a route through some of the oldest parts of the city.